Bajaj Auto Limited is an Indian two-wheeler and three-wheeler manufacturing company. Bajaj Auto manufactures and sells motorcycles, scooters and auto rickshaws. Bajaj Auto is a part of the Bajaj Group. It was founded by Jamnalal Bajaj in Rajasthan in the 1940s. It is based in Pune, Mumbai, with plants in Chakan (Pune), Waluj (near Aurangabad) and Pantnagar in Uttarakhand. The oldest plant at Akurdi (Pune) now houses the R&D centre 'Ahead'. Bajaj Auto is the world's sixth-largest manufacturer of motorcycles and the second-largest in India. It is the world’s largest three-wheeler manufacturer. On May 2015, its market capitalisation was ₹640 billion (US$9.5 billion), making it India's 23rd largest publicly traded company by market value. The Forbes Global 2000 list for the year 2012 ranked Bajaj Auto at 1,416. Bajaj Auto came into existence on 29 November 1944 as M/s Bachraj Trading Corporation Private Limited. It started off by selling imported two- and three-wheelers in India. In 1959, it obtained a licence from the Government of India to manufacture two-wheelers and three-wheelers and it became a public limited company in 1960. In 1970, it rolled out its 100,000th vehicle. In 1977, it sold 100,000 vehicles in a financial year. In 1985, it started producing at Waluj near Aurangabad. In 1986, it sold 500,000 vehicles in a financial year. In 1995, it rolled out its ten millionth vehicle and produced and sold one million vehicles in a year. With the launch of motorcycles in 1986, the company has changed its image from a scooter manufacturer to a two-wheeler manufacturer. According to the authors of Globality: Competing with Everyone from Everywhere for Everything, Bajaj has operations in 50 countries creating a line of bikes targeted to the preferences of entry-level buyers. Bajaj manufactures and sells motorcycles, scooters, auto-rickshaws and most recently, cars. Bajaj Auto is India’s largest exporter of motorcycles and three-wheelers. Bajaj Auto’s exports accounted for approx. 35% of its total sales. 47% of its exports are made to Africa. Boxer motorcycle is the largest selling single brand in Africa. Motorcycles in production are the Platina, Discover, Pulsar and Avenger and CT100. Bajaj also distributes motorcycles in India for other manufacturers, such as the Kawasaki Ninja 250R, the Ninja 650R and new for 2012, the KTM Duke 200 "KTM Duke 200". Retrieved 24 November 2016. & KTM Duke 390 "KTM Duke 390". Retrieved 24 November 2016. In FY 2012-13, it sold approx. 3.76 million motorcycles which accounted for 31% of the market share in India. Of these, approx. 2.46 million motorcycles (66%) were sold in India and remaining 34% were exported. It is the world's largest manufacturer of 3-wheelers and accounts for almost 84% of India’s three-wheeler exports. During the FY 2012-13, it sold approx. 480,000 three-wheelers which was 57% of the total market share in India. Out of these 480,000 three-wheelers, 53% were exported and remaining 47% were sold in India. In 2010, Bajaj Auto announced cooperation with Renault and Nissan Motor to develop a US$2,500 car, aiming at a fuel efficiency of 30 kilometres per litre (85 mpg-imp; 71 mpg-US) (3.3 L/100 km), or twice an average small car, and carbon dioxide emissions of 100 g/km. On 3 January 2012, Bajaj auto unveiled the Bajaj RE60, a mini car for intra-city urban transportation. The target customer group will be Bajaj's three-wheeler customers. According to its Managing Director Rajiv Bajaj, the RE60 powered by a new 200 cc rear mounted petrol engine will have a top speed of 70 kilometres per hour (43 mph), a mileage of 35 kilometres per litre (99 mpg-imp; 82 mpg-US) and carbon dioxide emissions of 60 g/km. 1971 Bajaj 150 scooter a clone of the Vespa 150 was sold for limited period. Bajaj Auto bought a controlling stake in the Tempo Firodia company, renaming it "Bajaj Tempo". Germany's Daimler-Benz, a long-time collaborator with Firodia because of their ownership of the original Tempo works in Germany, owned 16% of Bajaj Tempo. Daimler sold their stake back to the Firodia group in 2001, meaning that they once again held a controlling interest, with BAL retaining 24% of the shares. It was agreed that Bajaj Tempo would gradually phase out the use of the "Tempo" brand name, as it still belonged to Mercedes-Benz. The name of the company was changed to Force Motors in May 2005, dropping "Bajaj" as well as "Tempo", over the objections of Bajaj Auto with whom the company shares a long history as well as a compound wall. In November 2007, Bajaj Auto acquired 14.5% stake in KTM Power Sports AG (holding company of KTM Sportmotorcycles AG). The two companies have signed a cooperation deal, by which KTM will provide the know-how for joint development of the water-cooled four-stroke 125 and 250 cc engines, and Bajaj will take over the distribution of KTM products in India and some other Southeast Asian nations. As on 31 March 2013, Bajaj Auto held 47.96% stake in the company. The demerger of Bajaj Auto Ltd into three corporate entities—Bajaj Finserv Ltd (BFL), Bajaj Auto Ltd (BAL), and Bajaj Holdings and Investment Ltd (BHIL)—was completed with the shares listing on 26 May 2008. Bajaj Auto's equity shares are listed on Bombay Stock Exchange where it is a constituent of the BSE SENSEX index, and the National Stock Exchange of India where it is a constituent of the CNX Nifty. On 30 Sep 2015, 49.29% of the equity shares of the company were owned by the promoters Bajaj Group and the remaining were owned by others. Bajaj Auto had a total of 8,036 employees as of 31 March 2013, of which 51 were women (0.63%) and 25 were differently-abled (0.31%). It spent ₹6.5 billion (US$97 million) on employee benefit expenses during the FY 2012–13. The company is headed by Rahul Bajaj, whose net worth was around US$2 billion in March 2013. Bajaj Pulsar 135 LS received Bike of the Year 2010 award from BBC - TopGear and Bike India. Pulsar 220 DTS-Fi received the Bike of the Year 2008 award by all major Indian automobile magazines like Overdrive, AutoCar, Business Standard Motoring and Bike Top Gear. In 2006, Bajaj Auto won the Frost & Sullivan Super Platinum Award for manufacturing excellence in its Chakan Plant. It received award for The Most Customer Responsive Company in Automobiles category in a survey conducted by Economic Times for the years 2004, 2006 and 2008. Bajaj Auto received the Bike Maker of the Year award in ICICI Bank Overdrive Awards 2004. Bajaj Pulsar 180 DTS-i won the BBC World Wheels Viewers Choice Two Wheeler of the Year 2003 award. 1 2 "Bajaj Auto Quarterly Results". Retrieved 23 July 2016. ↑ "Company Profile - Bajaj Auto". IndiaInfoline. Retrieved 27 October 2013. 1 2 "Bajaj Auto at Forbes". Forbes. 31 May 2013. Retrieved 27 October 2013. ↑ "News Article". Reuters. 17 May 2012. Retrieved 22 May 2012. ↑ "Table 4-12: Top '50' Companies by Market Capitalisation as on March 31, 2013". NSE India. 31 March 2013. Retrieved 27 October 2013. 1 2 3 "Achievements 1945-1959". Bajaj Auto. Archived from the original on 29 October 2013. Retrieved 27 October 2013. 1 2 3 4 5 "Achievements 1960-1991". Bajaj Auto. Archived from the original on 29 October 2013. Retrieved 27 October 2013. ↑ "Achievements 1992-2009". Bajaj Auto. Archived from the original on 17 October 2013. Retrieved 27 October 2013. ↑ Sirkin, Harold L; James W. Hemerling, and Arindam K. Bhattacharya (11 June 2008). GLOBALITY: Competing with Everyone from Everywhere for Everything. New York: Business Plus, 304. ISBN 0-446-17829-2. ↑ "Kawasaki Ninja 25 chutia 0R | Kawasaki Ninja | Sports Bike | Probiking | 250cc Sports Bike | Bajaj Auto India". Bajajauto.com. Archived from the original on 3 February 2011. Retrieved 28 January 2011. ↑ "How green is my low-cost car? India revs up debate". ENN. 19 June 2008. Retrieved 24 November 2010. 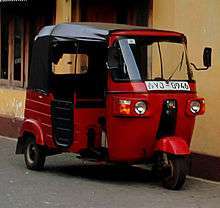 ↑ "Bajaj small car may cost Rs 1.1 lakh – News – Zigwheels". Timesofindia.zigwheels.com. Retrieved 24 November 2010. 1 2 "Bajaj Auto unveils small car RE 60 in partnership with Nissan and Renault". The Times of India. 3 January 2012. Retrieved 3 January 2012. ↑ Saxen, Ruchita (3 January 2012). "Bajaj Auto launches low cost car RE 60, promises 40 km per litre". New Delhi Television. Retrieved 3 January 2012. ↑ Srinivasan, Lalitha (24 September 1999). "Bajaj gets into the Spirit". Mumbai: Indian Express Newspapers (Bombay) Ltd. Archived from the original on 19 February 2013. Retrieved 13 April 2012. ↑ "Bajaj auto launch new Discover 125". The Hindu. 14 May 2012. Retrieved 8 July 2013. ↑ "Bajaj Auto Launches Discover 150F, 150S". Bloomberg TV India. ↑ Preetam Bora (2 March 2016). "Bajaj V15 Review". CarAndBike. ↑ "Bajaj Tempo will now be Force Motors". The Times of India. Bennett, Coleman & Co. Ltd. 24 February 2005. Retrieved 20 September 2013. ↑ "It's official: Bajaj Tempo is now Force Motors". The Economic Times. Bennett, Coleman & Co. Ltd. 12 May 2005. Retrieved 20 September 2013. ↑ "Bajaj Auto picks up 14.5% in European bike co KTM". The Economic Times. Retrieved 8 June 2016. ↑ "Bajaj Auto demerger complete". The Economic Times. 25 May 2008. Retrieved 21 May 2009. ↑ "Demerger News". Bajaj Auto. Archived from the original on 22 October 2013. Retrieved 27 October 2013. ↑ "Scripwise Weightages in S&P BSE SENSEX". BSE India. Retrieved 27 October 2013. ↑ "Download List of CNX Nifty stocks (.csv)". NSE India. Retrieved 27 October 2013. ↑ "Business Responsibility Report 2012-13" (PDF). Bajaj Auto. Archived from the original (PDF) on 29 October 2013. Retrieved 27 October 2013. ↑ "Rahul Bajaj at Forbes". Forbes. Retrieved 27 October 2013. ↑ "Awards and accolades 2010-2011". Bajaj Auto. Archived from the original on 29 October 2013. Retrieved 27 October 2013. ↑ "Awards and accolades 2007-2008". Bajaj Auto. Archived from the original on 29 October 2013. Retrieved 27 October 2013. ↑ "Bajaj Auto wins TPM Excellence Award 2006". MoneyControl.com. 7 February 2007. Retrieved 27 October 2013. ↑ "Awards and accolades 2005-2006". Bajaj Auto. Archived from the original on 29 October 2013. Retrieved 27 October 2013. ↑ "Awards and accolades 2003-2004". Bajaj Auto. Archived from the original on 29 October 2013. Retrieved 27 October 2013. ↑ "Awards and accolades 2002-2003". Bajaj Auto. Archived from the original on 29 October 2013. Retrieved 27 October 2013. Wikimedia Commons has media related to Bajaj Group.